January 15, 2015 Robert A. Weigand, Ph.D. This article represents Part 2 on the comparative performance of the 20 largest U.S. and European commercial banks since 2001. (The full paper is available for download from the Social Science Research Network: SSRN.) In yesterday’s post I showed how European banks were lagging U.S. banks in terms of revenue and loan growth, and how both sets of banks had not increased their allowance for loan loss accounts proportionately in the post-crisis period, despite much higher levels of impaired loans. Today’s post will compare these banks’ profitability, capital ratios, effective tax rates, payouts to shareholders and overall solvency. The graph below depicts the average net profit margin for both sets of banks 2001-2013. Margins trend higher every year through 2006, plunge during the crisis years, and begin recovering through 2010. 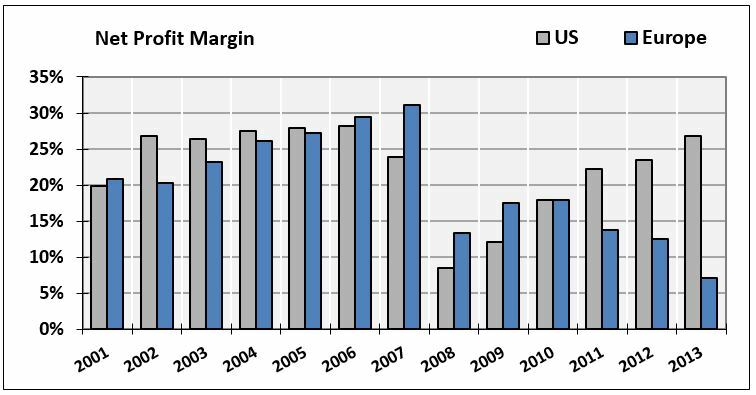 Afterwards, U.S. banks’ average margins trend back up to their pre-crisis levels, but European banks’ margins trend down for the next 4 years, all the way to a vapor-thin 7% by fiscal 2013. 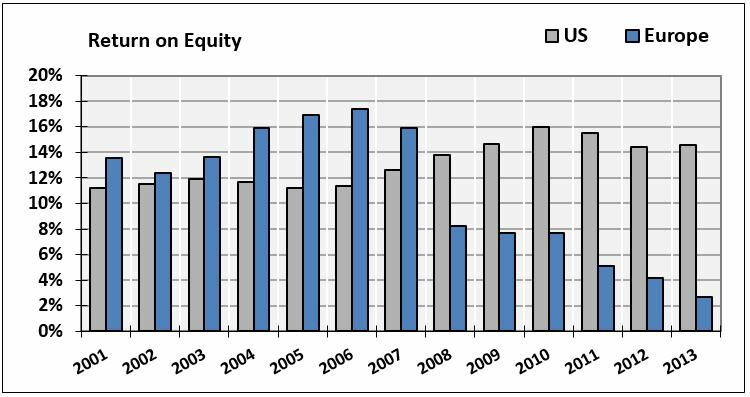 If we measure profitability as return on equity (ROE), the results are similar. U.S. banks’ average ROE post-crisis has been higher than its pre-crisis average, while European banks’ steadily contracting ROE (2.5% in fiscal 2013) reflects just how desperate their situation really is. 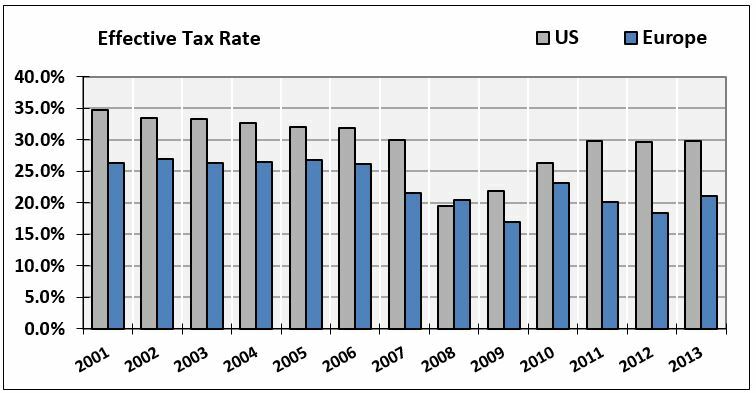 With U.S. banks’ average profit margins back to their pre-crisis levels and ROE consistently higher, one might expect banks to pay taxes at the same rate as they did pre-crisis — but that would occur only in a world that made sense. In our new, banker-centric universe, “profits up, tax rates down” seems to be one part of the new normal even Jamie (“help, we’re under attack”) Dimon would approve of. No sign of regulators ganging up on banks here. Now, it’s fair to say that global regulators have bombarded banks with complicated capital requirements under Dodd-Frank and Basel I, II, and III. And, based on the graph below, banks seem to be holding 2-3 times the Tier 1 capital required by Basel III. Good job, Mr. D . . . whoops, time out. I almost forgot about recent legislation that allows banks to keep trillions of dollars of derivatives positions off-balance sheet in units that are backstopped by the federal government. Thus, there is no need for the banks to hold capital against such risky positions, because, invoking Jerry Seinfeld: “Ms. Yellen, Mr. Draghi, you’re very good at creating the regulations, but you’re not so good at enforcing the regulations.” Must be tough when Citigroup lobbyists write the laws. The bottom line is, if banks had to hold capital against most of their derivatives positions they would still be vastly undercapitalized. U.S. banks continue using the political process to privatize their profits while socializing potential losses. Thus far we’ve seen that U.S. banks have higher profits, pay lower tax rates, and appear safer than ever based on their fat and juicy capital ratios — these banks must be returning a ton of cash back to shareholders, right? Well, maybe not. Below I’ve graphed a pseudo-payout ratio (banks’ dividends/revenue ratio, as volatile profits during the crisis years make a conventional payout ratio hard to interpret). 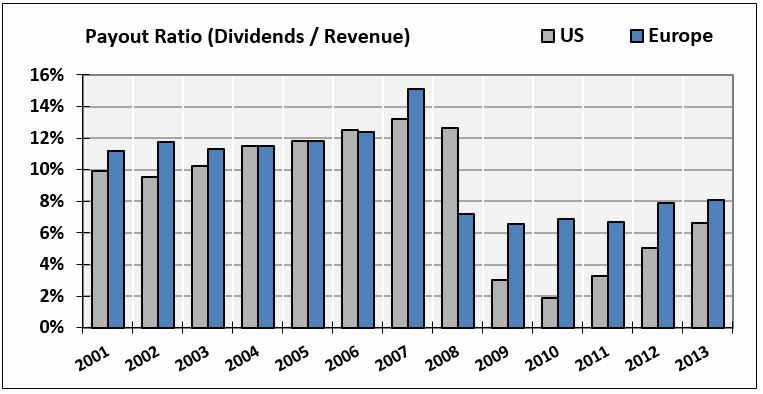 U.S. and European banks routinely paid out 10-12% of their revenues in the form of dividends pre-crisis, but post-crisis are paying 6%-8% (with Eurozone banks paying consistently more, despite their lower profitability). If we include share repurchase activity in shareholder payouts U.S. banks look a bit more respectable — but the total payout to shareholders remains little more than half its pre-crisis level. The last ratio measures banks’ overall solvency. 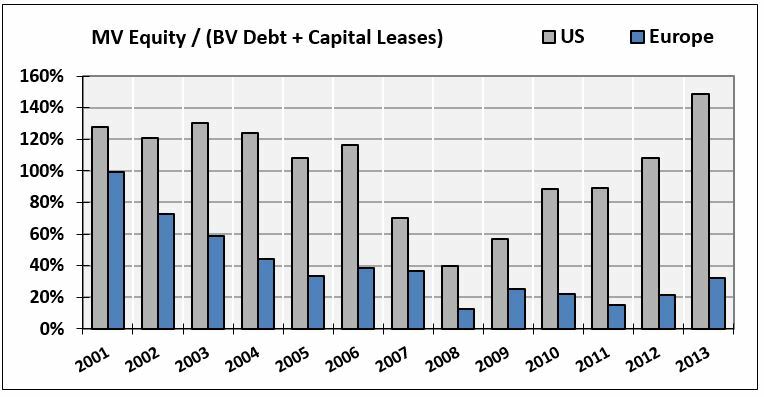 The ratio of a bank’s market capitalization to all debts plus capital leases is a component of Moody’s Expected Default Frequency (EDF™) calculation. The higher the ratio of value to debt, the lower the probability of default. The deteriorating financial position of European vs. U.S. banks in the pre-crisis period is evident in the graph. European banks’ value/debt ratio displays a long-term decline to less than 15% in 2008, and rises moderately, back to 35%, as of year-end 2013. The value/debt ratio depicts these banks’ precarious slide closer to insolvency, as European banks still owe almost 3 times more to creditors than the market value of their stock. U.S. banks’ mean value/debt ratio tells a completely different story. 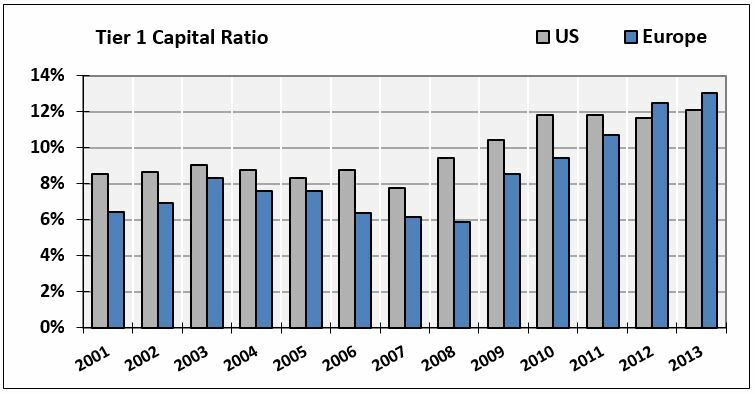 The ratio achieves a low of only 40% in 2008, and climbs every year thereafter, averaging almost 150% in 2013, which is higher than any pre-crisis value. The ratio suggests a complete return to financial health for U.S. banks, and offers little reason for continued coddling by the U.S. Federal Reserve. 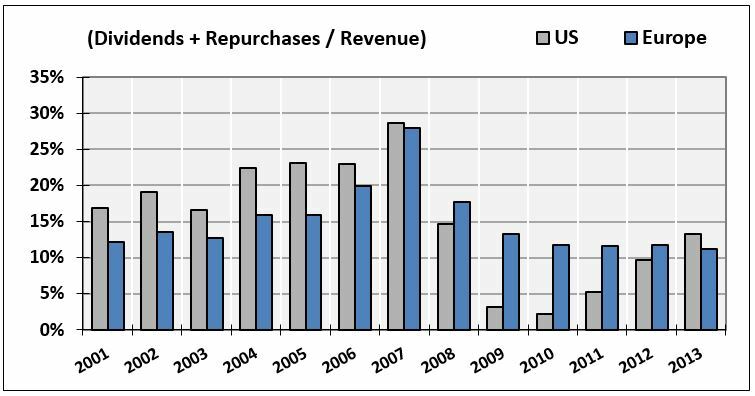 Conclusions: U.S. banks have been given 6 years to restore themselves to profitability — mission accomplished. But they still pay taxes, return cash to shareholders and dodge their capital requirements as if they were on the brink of collapse. European banks, on the other hand, remain trapped in a downward spiral of negative revenue and loan growth, decreasing profitability, increasing impaired and nonperforming loans, and are sporting market value to debt ratios that suggest imminent insolvency. Draghi’s “whatever it takes” promises will probably not be enough this time. Data obtained from S&P’s Capital IQ.